March against racism and Islamophobia, June 10. On June 10, ACT for America held Islamophobic “anti-sharia”marches in more than two dozen cities across the country, including one staged at the state Capitol building in Raleigh, N.C.
ACT and groups like it are promoting an “anti-sharia movement” that is nothing more than a thinly veiled cover for white supremacy and Islamophobia. ACT’s campaign has gained legislative power and propagated hate violence, like the recent white supremacist murder in Portland, Ore., of two people defending two young Muslim women. 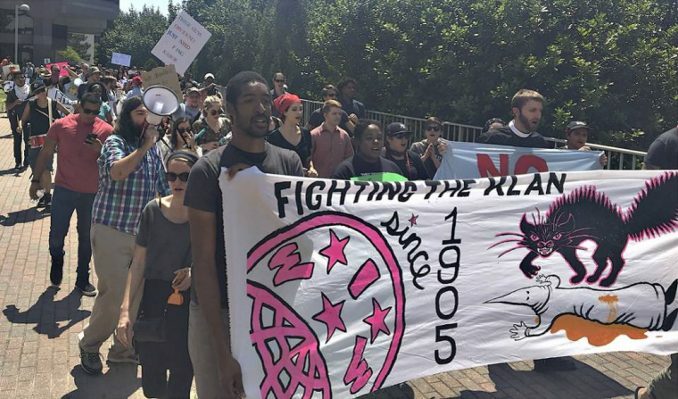 The planning of the Raleigh counter protest, United Against Islamophobia and Racism, was heavily influenced by the current climate and the timing of the anti-Muslim rally during the holy month of Ramadan. A call for action was first coordinated via Facebook and then turned over to Muslims for Social Justice and the Movement to End Racism and Islamophobia to ensure that the voices of those directly affected were heard. MSJ and MERI were joined by Electrical Workers Local 150 — N.C. Public Service Worker Union, ‎Comité de Acción Popular, the Triangle People’s Assembly, Workers World Party, International Workers of the World and others in organizing to oppose the ACT rally. The anti-Islamophobia/anti-war working group, along with MSJ, had previously hosted a few “know your rights” clinics at local mosques as trainings on how to look out for FBI and police repression. Members of the TPA also did outreach for the action by leafleting at Arab stores and at iftar at local mosques, to build mass support among the Muslim community. The counter protesters vastly outnumbered the ACT bigots. More than 250 people gathered in solidarity in Raleigh at the Legislative Mall to hear speakers, predominantly comprised of women of color, and then march to the Capitol to stage a noise protest aimed at drowning out the ACT speakers. After the rally, the entire contingent of counter protesters, many of whom were Muslim families, joined in the march and directly confronted the racists. The United Against Islamophobia and Racism demonstration ended in great success and with no harm to that contingent. Battling Islamophobia, racism and other oppressions is imperative. And this action is a reminder that all struggles must be linked.